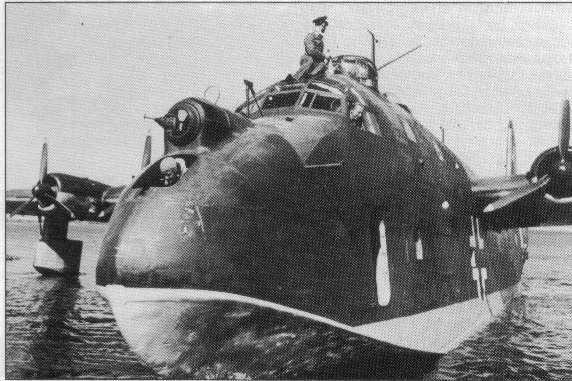 The Blohm & Voss BV 222 Wiking (German: "Viking") was a large, six-engined German flying boat of World War II. 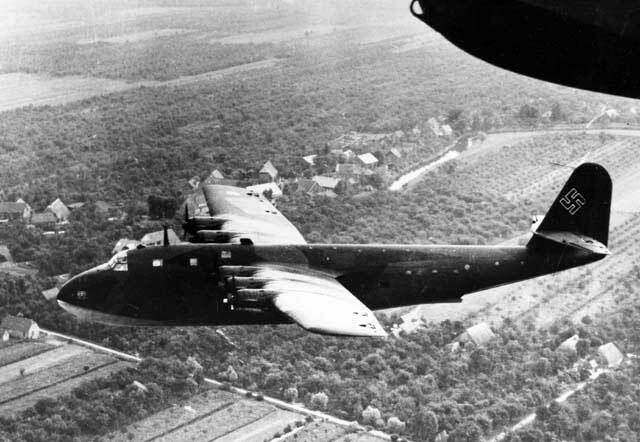 Originally designed as a commercial transport, and produced in only limited quantities, it was both the largest flying boat and largest aircraft to achieve operational status during the war. Prior to World War II, the German airline Luft Hansa had carried out many transatlantic mail flights. However, their main interest was passenger transport, and they initiated a program in 1936 that culminated in an order for three BV 222 flying boats designed by Dr. Richard Vogt. Construction of the first prototype, V1, began in January 1938, with construction of the V2 and V3 following within weeks. V1 made its test flight on 7 September 1940, carrying the civil registration D-ANTE. During trials it demonstrated that it could carry up to 92 passengers, or 72 patients on stretchers over short distances at a maximum speed of 385km/h (239mph). The flight characteristics were found to be satisfactory, but with some improvements required. Further trials lasted until December 1940, when the V1 passed into Luftwaffe service, receiving a military paint scheme, when in service with Lufttransportgruppe (See) 222. The type was noted for a long flat floor inside the cabin and a large square cargo door aft of the wing on the starboard side, with such a flat floor for the hull interior being a welcome novelty for that era. The usual balance floats for a flying boat design were ingeniously designed as a matching pair of retracting float units per side, which extended from beneath the wing's outer panels in "clamshell" fashion when fully extended, and fit fully flush with the wing panels' undersides when retracted. Only 13 aircraft are thought to have been completed. Around the turn of the Century, Revell Germany started issuing a series of adventurous models of large transport and bomber aircraft in1/72 scale. The BV 222 first saw light of day in 2002. Revell's kit represents the Bramo radial engined V.1 transport or V.2 reconnaissance version equipped with FuG 200 Hohentweil surface search radar. Although the review copy's box had been slightly squashed in transit, the sprues were still pristine with the exception of two parts which had come adrift to be caught inside their plastic bags. The moulding is crisp, but a certain amount of flash is present due to the age of the moulds. The model is impressively large. The fuselage is moulded in left and right halves up to behind the cockpit, with separate left and right halves for the nose. The cockpit is nice and busy, with sharp detail and extends fairly deeply into the fuselage. Not very much of this will be seen when the model is closed up, unless you follow the instructions' suggestion to leave the upper forward fuselage roof unglued. The main and upper cargo decks run the full length of the fuselage, and with their bulkheads will contribute much towards the eventual strength of what will become a very large assembly. The cargo doors are separate, but do not appear to be engineered to be posed open. The personnel doors on the port side nose may be posed open. The wings are provided in the traditional top and bottom halves. They have a very substantial spar which plugs into a hole in the wing root and interlocks together. The floats may be assembled extended or retracted. The unique gun turrets behind the outboard engines may be left movable or glued into place. Early aircraft were fitted with six Bramo radials, which are provided on leading edge inserts. The cowling access doors may be posed open, showing off the nicely detailed engines. The separate leading edge suggests that Revell may be planning to issue the later production Deisel engines in the future. The rudder is moulded in situ with the fuselage halves. The stabilisers and elevators are moulded in upper and lower halves. The control surfaces would need some surgery to be posed deflected. Flying boats are remarkably deficient in landing gear. The kit does not provide beaching gear, nor is a stand provided. I don't compare models to drawings or published measurements. When assembled it will look like a Wiking. Markings are provided for the V.1 and V.2 Wikings. The V.1 is in the standard Luftwaffe over-water scheme of RLM 72/73 splinter scheme over RLM 65 undersides. White Theatre markings place this aircraft in the Mediterranean Sea during 1942/43. Distinctive unit markings are confined to a white diagonal stripe on the rudder with tactical numbers “S1”, and a Viking ship badge on the nose. The second option is for the V.2 in a very dramatic temporary winter camouflage scheme with large areas of white painted over the standard splinter which the aircraft wore during a dramatic rescue mission it flew for “Operation Schatzgräber”, the rescue of the crew of a German weather station located on Alexandra Land high in the Russian Arctic Islands. Since the kit was produced in Germany, the decal sheet does not contain swastikas, which would need to come from an aftermarket sheet. The decals are typical Revell of Germany/Cartograf issue, which means a nice glossy finish, excellent register and very crisp printing. The unarmed V.1 in flight. the nose of either V.2 or V.3 (note the radial engines and nose gun turret). V.1 showing off its size early on in its career. Verdict: Luftwaffe fans and those who like something a little out of the ordinary will find this a pleasant build. My oh my, I wish I hadn't sold mine 7 years ago. But I'd probably not have built it yet. I remember it as having good cockpit detail but that for its size, one can not see into it. Same for the detail of those closely-cowled Bramos. Overall I recall it is an impressive good looking model.